Just because something bears the aspect of the inevitable one should not, therefore, go along willingly with it. Useful advice for anyone involved in the work of an institution. I for one always mistrust institutional rhetoric of the inevitable. (Look, there’s some now, coming down the pike.) To my mind, the claim that something is inevitable might alone be reason enough to object. 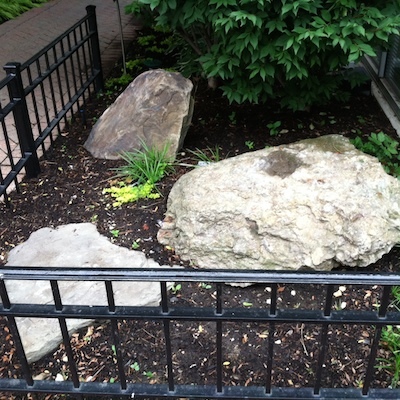 As seen on Sherman Avenue in Evanston, Illinois, “some rocks,” in a simulation of their native habitat. On the road to the cute-ification of everything: Brickjest, scenes from David Foster Wallace’s Infinite Jest recreated in LEGO® blocks. Like they say, this is wrong on so many levels. I may be misjudging. But at least I’ll never make the mistake of saying Legos again. All these kindnesses were crowned with a dazzling consummation. I had said that my books, after the lost diary, were what I missed most. I ought to have known by now that mention of loss had only one result under this roof . . . What books? I had named them; when the time came for farewells, the Baron said: “We can’t do much about the others but here’s Horace for you.” He put a small duodecimo volume in my hand. It was the Odes and Epodes, beautifully printed on thin paper in Amsterdam in the middle of the seventeenth century, bound in hard green leather with gilt lettering. The leather on the spine had faded but the sides were as bright as grass after rain and the little book opened and shut as compactly as a Chinese casket. There were gold edges to the pages and a faded marker of scarlet silk slanted across the long S’s of the text and the charming engraved vignettes: cornucopias, lyres, panpipes, chaplets of olive and bay and myrtle. Small mezzotints showed the Forum and the Capitol and imaginary Sabine landscapes; Tibur, Lucretilis, the Bandusian spring, Socrate, Venusia . . . I made a feint at disclaiming a treasure so far beyond the status of the rough travels ahead. But I had been forestalled, I saw with relief, by an inscription: “To our young friend,” etc., on the page opposite an emblematic ex libris with the name of their machiolated Baltic home. Here and there between the pages a skeleton leaf conjured up those lost woods. Patrick Leigh Fermor, A Time of Gifts: On Foot to Constantinople: From the Hook of Holland to the Middle Danube (1977). A Time of Gifts is the first of three books recounting this journey. The others: Between the Woods and the Water: On Foot to Constantinople: From The Middle Danube to the Iron Gates (1986) and The Broken Road: Travels from Bulgaria to Mount Athos (2013). The best parts of A Time of Gifts thus far: its scenes of hospitality. Just as a car needs gasoline to run, your body needs carbohydrates. What bothers me about the Beloit list involves some unspoken assumptions about reality and young adults. The list reads like a nightmare-version of the proposition that begins Ludwig Wittgenstein’s Tractatus Logico-Philosophicus (1921): “Die Welt ist alles, was der Fall ist.” “The world is all that is the case” — all that is the case, that is, in the life-experience of a hypothetical eighteen-year-old American student. . . . The Beloit list seems to suggest that if it hasn’t happened during your lifetime, well, it can’t really be real (witness the weirdly Orwellian statement that “Czechoslovakia has never existed”), or, at best, that you cannot be expected to know or care about it. Even the ugly word mindset reinforces that implication: “the established set of attitudes held by someone,” says the Oxford American Dictionary. The OAD illustrates that meaning with a sentence about being stuck. I know what he meant: ”a hundred, ninety-eight." But the alternative seemed kinda plausible. Right now it’s 91 °F and feels like 99 °F. Twenty Questions The truth of the mystery postcard revealed. µBlock for Google Chrome: Another reason to like µBlock. My wife Elaine has begun postings photographs of her mother’s artwork: June Fine’s Paintings and Drawings. I found this postcard between two books today. I’d forgotten I ever had it. I like the sentiment, which seems to me fitting for the start of a college semester. 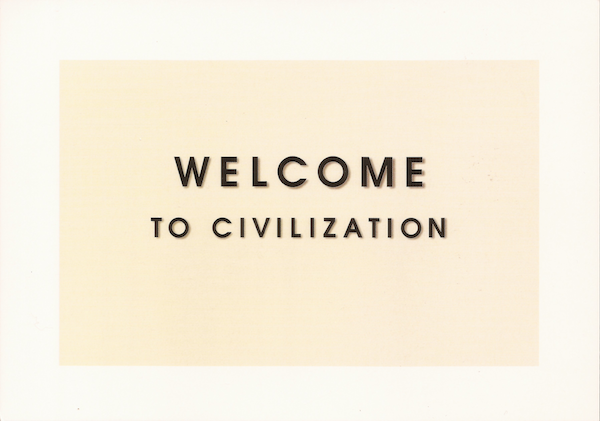 This postcard has, however, an ulterior motive. It’s a piece of advertising. Can you guess what for? Welcome to what I suspect will be a pretty quick game of Twenty Questions. Leave your best questions in the comments. Play early, play often. August 26: My wife Elaine came closer in offline play: Alcohol? Yes. Clear? No. Brown? Yes. Bourbon? No. Scotch? Yes. But she couldn’t get the brand. 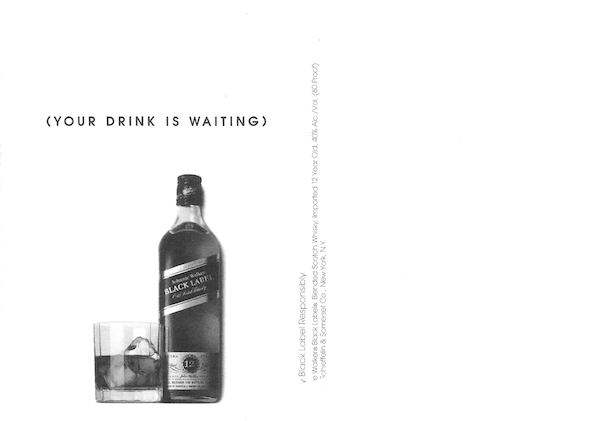 Barnaby has the answer in the comments: it’s an advertisement for Johnnie Walker. Specifically, Black. What’s that? Syllabus week ? I never heard of the thing. 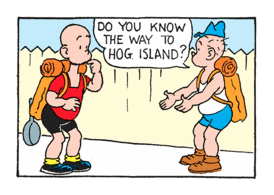 Today’s Henry (which is always yesterday’s Henry, as the strip is in reruns) raises an urgent question: where are Henry and his unidentified comrade headed? They could be preparing to visit an island in Arizona, Arkansas, California, Connecticut, Florida, New York, Maine, Maryland, Massachusetts, Michigan, New York, Rhode Island, Virginia, or Wisconsin. Or an island in Australia, the Falklands, Guyana, or Honduras. Or a now-defunct Philadelphia neighborhood that was not an island. That last possibility might require a time machine, not a frying pan. Henry is a city kid, surrounded by stores selling Novelties and Notions and Meats. So I cast a vote for the Bronx’s Hog Island, though I too have no idea how to get there. µBlock is an ad-blocking extension for Chromium-based browsers. The extension’s developer Raymond Hill says that µBlock uses significantly fewer resources than AdBlock Plus. That’s certainly the case on my Mac. Your figurative mileage may vary. To see what’s going on under the figurative hood and what resources an extension is using, use Chrome’s Task Manager, available from the Menu Bar (Window ➝ Task Manager) or from the hamburger menu (☰) to the right of the Address Bar. There’s no keyboard shortcut for getting to the Task Manager on a Mac, but you can be sneaky and create one. August 25: Another reason to like µBlock: I ran into a problem with whitelisting, e-mailed Raymond Hill last night, and this morning there was a new version of µBlock at GitHub, problem solved. Thank you, Raymond. The zip-line has become a fairly routine element in first-week-of-school activities on American college campuses. At least one school has assured students that though its zip-line line may not be spectacular, it serves the institution’s purpose. That purpose would appear to be Fun. And I have nothing against Fun. There shall be Fun. But the purpose of a college or university, as I understand it, is another matter. If anyone had told me that my first week of college would include a ride on a zip-line, I would have thought they were on something. You know, the way people used to say it — on something. Sean at Contrapuntalism sent this beautiful image from the fourth season of the HBO series Boardwalk Empire. 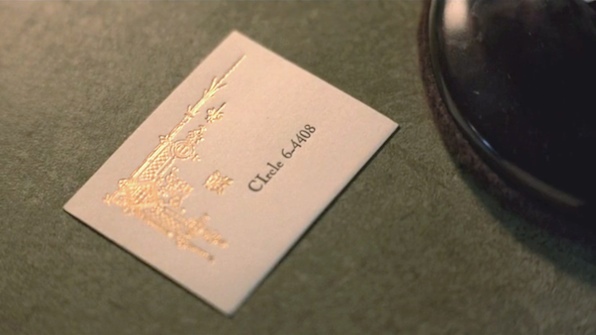 As he observes, this card is “quite literally a ‘calling card.’” Notice the felt under the telephone. Open the book to page ninety-nine and read, and the quality of the whole will be revealed to you. So it’s the page-ninety test. Adjust your sampling accordingly. Turning to page ninety-nine has saved me significant sums in bookstores, most recently when I sampled a book on making great sentences, something that might have been useful for teaching. But there on page ninety-nine: a sentence beginning “Having said that.” Like “that said,” “having said that” is a ponderous way to begin a sentence. Now I wonder what page ninety would have shown me. Fresca asks a great question: What songs will we remember after we forget our names? Go read her post and leave your list. The context for this question: the film Alive Inside. Cardboard in its own juices. There are many such to sleep through. We’d meet beside a lotus-covered door. Marshall was a character, a singular person. He always seemed to me like a man who stepped into our world from the nineteenth century, a learned professor of some -ology or other. (He was in truth a violist, violinist, pianist, conductor, and composer.) As Elaine wrote today, stories about Marshall “are ALWAYS interesting and colorful.” There will be less color in the world without him. Elaine has posted two photographs of herself and her brother in kidhood and adulthood. I have been assured, by someone who should know, that I would never make it as a kindergarten teacher, because I’d be writing everything down. Too cute. That’s Congressman John Shimkus (R, Illinois-15), speaking of the Republican candidate for Illinois governor, Bruce Rauner. Whether Shimkus knows it or not, he’s comparing Rauner to Benito Mussolini — and favorably. The comparison fails in three ways: 1. Mussolini wasn’t responsible for making trains run on time. 2. The claim that he did make trains run on time is typically advanced as a grim joke: “Yes, but he made the trains run on time.” 3. It is inadvisable to laud an American political candidate by likening that candidate to a fascist dictator. You may remember Congressman Shimkus making the news in 2009 for his observation that we need not worry about rising sea levels because God promised not to destroy the world by flood. For more on Mussolini and trains, see snopes.com. Some context for this passage: Tod Clifton, the unnamed narrator’s former comrade in the Brotherhood (an organization modeled on the American Communist Party) is now working as a street vendor selling dancing paper dolls, Sambo dolls, on Fifth Avenue in midtown Manhattan. 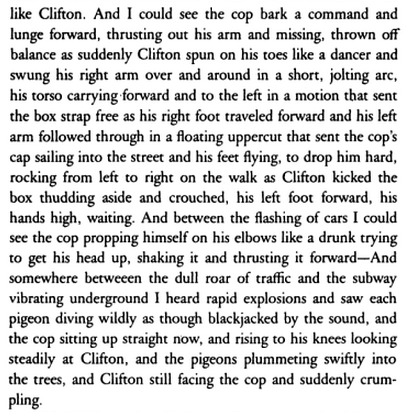 Clifton sees a policeman, packs up his box of merchandise, and gets going. The policeman starts walking behind him. On Forty-Second Street, outside Bryant Park, the two men meet, and Tod Clifton’s life comes to an end. There may be no exact parallel between what happens in Ellison’s novel and what happened in Ferguson, Missouri. But across sixty-two years, the general resemblance is clear and appalling. Sad to think of the conversations — and non-conversations — that must have taken place in this house. “!” indeed. It is both dismaying and inspiring to know that it wasn’t always three rocks. It was sometimes one rock, sometimes a pair, sometimes four or more. The variations are dismaying for the obvious reason: because they’re not “some rocks.” And yet they reveal an artist willing to experiment, to explore, to grapple with his materials, to challenge conventional expectations. Yes, inspiring. Rogeting A commenter has left a stunning account of one student’s Rogeting and the work needed to track it down. You have to read peruse it to believe trust it. The customer-service rep was telling me the truth when I called yesterday: the Internets were broken, at least for many users. Why this news hasn’t been more widely reported, I don’t know. But I’m doing my bit. In the teaching world, the idea of reading upward often leads to a preoccupation with gateway books. The way to get “them” interested in, say, Charles Dickens, is to start with, say, J. K. Rowling. Uh, no. There are such things as gateway books, books that open up new territory: I’ve described my first acquaintance with Charles Bukowski’s poetry in just that way. But the way to get interested in, say, Dickens is by reading Dickens. There is no other first step needed. The actor and comedian Robin Williams has died, an apparent suicide. So much sorrow in the world, far and near. In the words of Frank O’Hara: No more dying. Elaine’s brother Marshall Fine was in a horrific car accident last week. We learned about it late Saturday night and spent Sunday in Kentucky, visiting him in the hospital and retrieving his stuff from his car. We were assisted by an incredibly kind state trooper and an equally kind tow-operator. The injuries are grievous, but there is much reason to think that Marshall will recover. If you have some good vibrations to spare, please send them his way. 7:55 p.m.: As I wrote in a comment earlier today, there’s less reason to be hopeful than there was when I wrote this post. But Marshall is getting excellent care, and we are still hopeful. At the community college where my wife Elaine taught for a number of years, eight adjunct faculty have just learned that some or all of their fall classes have been canceled. They have received this news three weeks before the fall semester begins. Adjunct is a strange term: what’s adjunct is supplemental, not essential. Yet so-called adjunct faculty are now a substantial majority of college faculty. A more accurate term: contingent faculty. As the AAUP says, such faculty serve “in insecure, unsupported positions with little job security and few protections for academic freedom.” See the previous paragraph. That students could hope to succeed by means of such substitutions suggests that something is broken — in their understanding of how language works, and in their ability to imagine a reader’s response to their writing. Thanks to Ian Bagger for sending The Guardian article my way. I know where I was on August 9, 1974: at home watching television. I remember the farewell speech — “My mother was a saint” — as painful to watch. I despised the man, but I took no pleasure in this sad spectacle. His life was in ruins, and there was his family, standing off to the side having to see it. 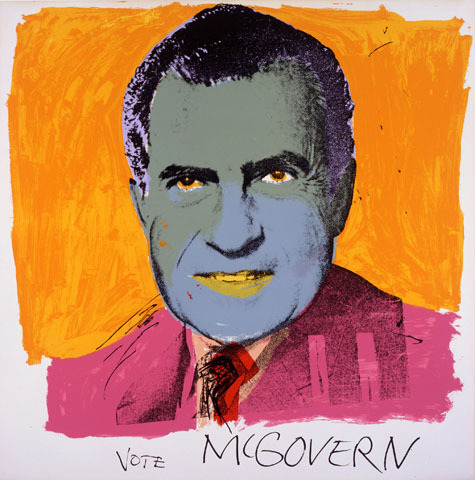 I have more vivid memories of the day before the resignation, the day Nixon announced that he would resign. I was working as my dad’s helper (tile work) at the house of a woman named Mrs. Zargami, somewhere in northern New Jersey. We had a transistor radio on and heard the news — in the afternoon, I think — that Nixon was going to address the nation that night. Mrs. Zargami gave me a twenty-dollar bill at the end of the day. I wondered whether she realized that my dad was paying me. We drove home and we all had dinner, and later that night we turned on the TV. Where were you when Richard Nixon resigned? Handwrytten allows you to send real cards and notes with your message written in pen and ink. Just select a quality card, type your message and hit send! Then, our robotic handwriting machines will “wryte” your message in realistic handwriting on the card, address the envelope and place it in the mail with a real stamp. Well, he could have been joking. Hard to say. 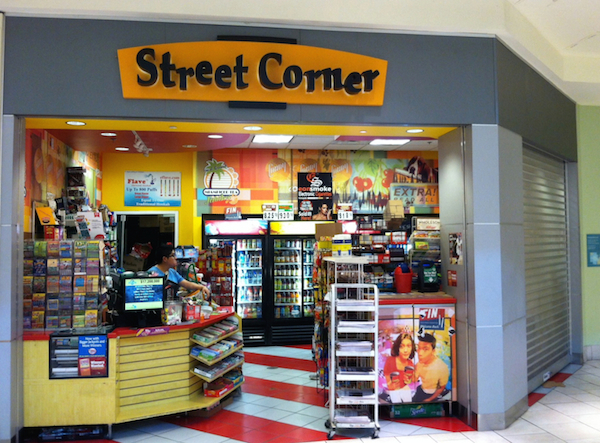 As seen earlier this summer at Garden State Plaza, Paramus, New Jersey. J. D. Salinger. Three Early Stories. Illustrated by Anna Rose Yoken. Memphis: Devault-Graves, 2014. $14.95 paperback. $8.99 e-book. $3.95 audio. 69 pages. Three Early Stories reprints work to which J. D. Salinger, careful though he was, never lay claim: “The Young Folks” (Story, 1940), “Go See Eddie” (University of Kansas City Review, 1940), “Once a Week Won’t Kill You” (Story, 1944). The stories are short, and slight. Gathered here, they make a meager bouquet, but a bouquet nonetheless, and a wondrous one, something rather than nothing. In the first of these stories, a young woman at a party of “noisy young people” works hard to make conversation with a young man whose attention is directed to a “small blonde” who sits on the floor, at some distance. The blonde is laughing and already commanding the attention of at least three other young men. In the second story, a brother attempts to exert authority over his sister’s life by insisting that she give up her married lover and “Go see Eddie” about a job. In the third, a young soldier packs his suitcase and talks with his wife and aunt before shipping out. He struggles about how to tell Aunt Rena (now lost in a placid dementia) that he is leaving. These characters are recognizable as Salinger people: they smoke cigarettes, squint to avoid the smoke from their cigarettes, sip coffee, bite their fingernails. At least two characters are marked by lovely idiosyncrasies: the soldier remembers that his mother always whistled a risqué song through her teeth when drawing the blinds; the soldier’s aunt has started collecting canceled two-cent stamps. We are not far from Jane Gallagher’s habit of keeping her kings in the back row. “Have you ever seen his wife?” Bobby asked. 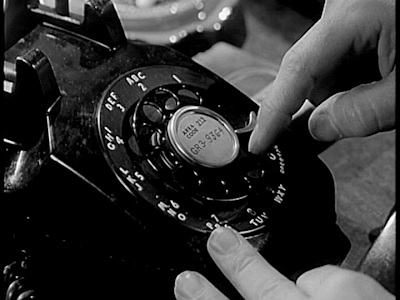 There’s an element of defensiveness in Salinger’s effort to capture tone by means typography: “It had been three years and she had never stopped talking to him in italics,” the narrator observes. In other words, that’s just how she talks. Salinger’s characters would never stop talking in italics. Also on display in these stories is Salinger’s indebtedness to Ernest Hemingway. A sentence in “Once a Week” about a woman’s arms — “They were brown and round and good” — is either hapless imitation or fine parody. The real debt to Hemingway in these stories involves narrative silence. Hugh Kenner offers a brilliant characterization of Hemingway’s achievement as a matter of “setting down, so sparely that we can see past them, the words for the action that concealed the real action.” After the distracted male partygoer walks off to pay attention to the blonde, Edna Phillips retreats to a forbidden part of her host’s house (a parental bedroom? ), and returns with cigarettes. She is gone nearly twenty minutes: doing what? Grieving her social failure? The sudden violence of brother against sister suggests that the exhortation to “Go see Eddie” is just one more moment in a long history of sibling conflict and sexual tension. The poignance of Aunt Rena’s Miss Havishamish existence and the great losses that lie in her past are left for the reader to infer — or is it only suspect? — from a handful of details. About the design of Three Early Stories: the cover is promising in its Salingerian austerity, but inside are mistaken choices. The text is printed recto-only in a large thin font (a Goudy Californian, I think), with a ragged right margin and generous space between lines. There are only thirty-two pages of text, and ten full-page illustrations. The design, especially when text and illustration appear side by side, too strongly resembles that of a young reader’s chapter book. This book is of course the first illustrated edition of Salinger, illustrations or annotations having been a requirement for permission to reprint. Anna Rose Yoken, the book’s illustrator, appears to be an artist of genuine ability, but her work here looks unidiomatic, far removed from the sophistication of mid-century commercial illustration. I’d like to see larger margins, a more substantial font, small blocks of text recto and verso, and (if need be) a handful of small line drawings. And one annotation I’d like to see: an explanation of “Tea Gardens” (for “Teagardens,” recordings by Jack Teagarden). Is that Salinger’s joke? Or an error in the original publication? New Salinger work is supposed to begin arriving in 2015: David Shields and Shane Salerno’s Salinger (2013) describes five volumes to come but makes no mention of the early stories. Will Three Early Stories (and last year’s digital bootleg of three unpublished early stories) move the Salinger estate to consider making all the early work available in book form? I think that’s unlikely. Which makes the legitimate publication of these three stories an even more wondrous thing. For anyone who is getting older, Just Shoot Me offers excellent food for thought. And as Elaine Stritch seems to have been fond of pointing out, we are all getting older. We may distinguish both true and false needs. “False” are those which are superimposed upon the individual by particular social interests in his repression: the needs which perpetuate toil, aggressiveness, misery, and injustice. . . . Most of the prevailing needs to relax, to have fun, to behave and consume in accordance with the advertisements, to love and hate what others love and hate, belong to this category of false needs. The term “false needs” is related of course to the Marxist idea of false consciousness. 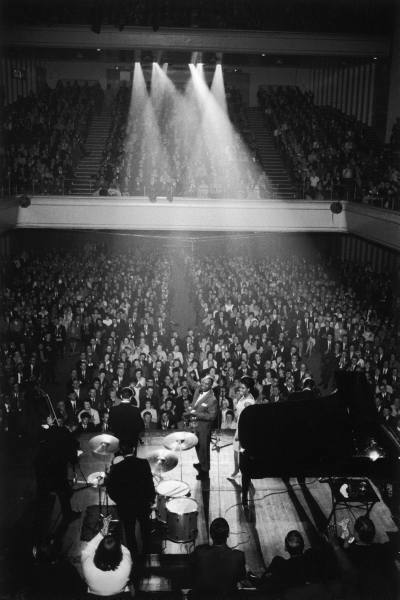 “Musician Louis Armstrong waving to the audience seated at back of the stage.” Photograph by John Loengard. Manchester, United Kingdom, 1965. From the Life Photo Archive. The Naked City also contains at least one pay telephone in the GRamercy exchange. This desk phone is a model 500. This three-part model reminds me of Betty S. Flowers’s four-part model for the work of the writer: madman, architect, carpenter, judge. Flowers’s madman and architect are more or less Benjamin’s composer; her carpenter is his builder. Flowers’s carpenter and judge share the work of Benjamin’s weaver. I think. What all good writers know is that the work of writing is many kinds of work, not to be attempted all at once.